Samsung overhauled its flagship Galaxy S smartphone series with a premium design in 2015. This came with some tough decisions, however, and microSD card support and water resistance were both dropped. Still, the Galaxy S6 and the Galaxy S6 Edge+ were high performers last year. Now in 2016, Samsung has stepped back in time to re-introduce memory expansion and water resistance with the Galaxy S7 and Galaxy S7 Edge. In this Galaxy S7 Edge review, we’ll take a look at how this year is the one in which the Galaxy S evolved into its most perfect state yet. The Galaxy S7 Edge has been available for pre-orders since it was launched in February, but it officially goes on sale on March 11. AT&T is selling the device for $794.99, T-Mobile for $779.99, Sprint for $728 and Verizon for $792. It’ll be available with 32 GB of internal memory in gold, black and silver. Bear in mind, carrier pricing can vary by plan and location. The biggest difference between the Galaxy S7 and Galaxy S7 Edge is display size, at 5.1 inches and 5.5 inches respectively. However, even with an increase of 0.4 inches, the S7 Edge is surprisingly compact. Compared to previous dual-edge models, the S7 Edge is more beautiful, offers excellent grip and the camera bulge has been almost completely removed. To get an idea, the camera's rear bulge decreased to 0.46 mm and is virtually nonexistent. In short, this device is beautiful. In fact, I think the S7 Edge is the best-looking phone you can buy right now. Build materials are top notch, with an aluminum frame and Gorilla Glass 4 on front and rear. This means that you’ll have extra protection against cracks, but it’s not unbreakable like the Moto X Force. The camera's rear bulge decreased to 0.46 mm and is virtually non-existent. In the Galaxy S7 Edge, the metal edges on both sides are quite narrow, as you can see in the images. This gives it a clear visual difference between it and the iPhone. At the top is the nano SIM card and microSD slot. Once you open it, you’ll find a tray to insert both cards. Memory can be expanded up to 200 GB via microSD. At the bottom is the speaker and, just like the S6 Edge+, is a micro USB port and the headphone jack. I honestly think Samsung should invest in stereo speakers as with such a high-quality display it seems like the minimum acceptable standard. For stereo audio, you’ll need to settle for using headphones. Don't get me wrong - I don’t like someone beside me on the subway using their phone's loudspeaker, but at home it would have been nice. As seen in previous models of the line, the Galaxy S7 Edge also uses the home button as a fingerprint scanner. The configuration of this feature is fast and works well. However, the Galaxy S7 Edge is certified IP68 for dust and water resistance. This means you can use the device for about 30 minutes at a depth of 1.5m of water. When my finger or the device itself is wet, the fingerprint reader does not work however, so if you’re at home cooking and your hand is wet, the device will not unlock. The solution here is to use Smart Lock to make the device recognize trusted locations and remain unlocked. I think Samsung’s choice to launch a dual-edge model at 5.5 inches instead of 5.1 inches, unlike last year, was a smart move. This is because the differences between the Galaxy S7 and S7 Galaxy Edge would be very small. If the company was still considering launching the "Plus" version of this device, it would need to make huge changes to avoid launching two very similar devices. So far, Samsung released five different colors for its Galaxy S7 Edge device: Black Onyx, Gold Platinum, White Pearl, Silver Titanium and Pink Gold. Now, Coral Blue is being added to the lineup. It's available starting November 1, in select markets around the world. The color is really a combination of two different tones. A bluish hue on the front and back with a gold border running around the border. Have a look at the official renders below. Samsung is planning to release a new color in December. Photos have just been leaked by a Samsung official on their Weibo account of a "Glossy Black" version of the Galaxy S7 Edge, which look similar to Apple's iPhone 7 in Jet Black. The S7 Edge inherited the screen resolution of its predecessor rather jumping to 4K. On the one hand this could be a frustrating choice for a device launched under the guise of a virtual reality revolution. However, the S7 Edge display leaves nothing to be desired in quality when it comes to everyday use. The handset comes with a Super AMOLED display of 5.5 inches and, of course, what makes it unique are the curved lateral edges. The WQHD resolution of 2560 x 1440 provides a pixel density of 534 ppi (pixel per square inch). Color saturation is one of the best on any device with an AMOLED display. Viewing angles are very good, with the ability to identify what is on the screen with the device at an angle of 80 to 85 degrees. What is striking is that Samsung really pumped up maximum brightness. That could be annoying when you’re in a dark room, especially when you are reading at night. However, there’s a significant improvement in readability during the day. Between the two, I am happy to see better readability under direct sunlight and you could just always adjust brightness manually anyway. The screen’s curved edges are also a benefit to the Gear VR. When you use the Galaxy S7, by comparison, it is possible to see the side edges of the phone. With the S7 Edge, you can't. For the first time, I had the impression that Samsung brought something really special to its smartphones in relation to software functions. The Game Launcher functions as a center for games and automatically adds games to a specific folder that will suggest titles you might like. But what is even better in the Game Launcher are its features, such as options to save battery while you play, choose to stop alerts while you play, access the most popular games, featured videos and, most interesting of all, enable the floating button ‘Game Tool’. The Game Tool employs some Google Play Games features, such as being able to record matches to share with other users. The tool is useful, especially for those who use their phones to play but have no patience for capacitive keys that end up being activated unintentionally during a match, thus hampering the gaming experience. The Galaxy S7 Edge is, along with the Galaxy S7, one of the first smart phones compatible with the Vulkan API. This API has been designed to complement existing technologies like OpenGL and OpenGL ES. The goal is that in the near future Vulkan will become a standard for creating graphics solutions in 3D, both on PC and on mobile devices. Of course, this API is not exclusive of the new Galaxy S line, but shows how Samsung is committed to making the gaming experience better. We all know that Samsung invested in a breathtaking presentation for the launch of the Galaxy S7 Edge. To the surprise of those who attended the launch, Samsung made use of its virtual reality gadget, the Gear VR, during the show. I have to say that the experience with 360-degree video was great. But have you ever wondered what would happen if the company changed the micro USB port from Type-B to Type-C? It would have to redesign all its accessories, and with it, the Gear VR. To streamline any port connectivity issues, Samsung provides a micro USB adapter with the Galaxy S7 Edge so you can connect it to any device with micro USB port. This allows you to share files quickly, as I saw when I downloaded my entire Galaxy S7 Edge picture gallery onto my Xperia Z2 in a matter of minutes. The Galaxy S7 Edge comes with Android 6.0.1 Marshmallow and TouchWiz has not changed much compared to the Galaxy S6 Edge+ or Galaxy Note 5. This Samsung skin, as we know, was overhauled last year, lightened, bloatware removed and features optimized. Yet the system still takes up little more than 7 GB of internal memory. Remember that the 32 GB you pay for ends up as only 25 GB of usable space. In the Galaxy S7 Edge we can see Android 6.0 Marshmallow features brought over to TouchWiz, such as changes to the arrangement and layout of the status bar and improved quick shortcuts. Previous problems, such as with RAM usage, have been resolved. Regarding bloatware, we have seven apps from Samsung, five from Microsoft, and, of course, Google Apps, Facebook and WhatsApp. But there are still another 25 pre-installed apps. However, the system proved to be clever, because when you start using the S7 Edge these apps don’t show up, and neither was the Game Launcher the default application for use with the Gear VR. However, when downloading my first game, the system automatically offered the option to enable the Game Launcher. The same happened when placing the Gear VR on and the phone automatically asked by a voice command to download Oculus services. But on removing the device from the virtual reality headset, it was already set to download the software. The ‘Edge Screen’ is dedicated to dual-edge models and allows you to slide your finger from a tab on the right of the screen to access a list of services. The service was known as the link function in the past, which still exists and offers the chance to add up to five favorite contacts, identified with different colors, as a kind of shortcut to the main contacts from your address book. However, Samsung has expanded the range of the Edge Screen functions and can now add two columns instead of just one to access a greater number of features. You can add your favorite websites, too. This feature is cool but, honestly, I’m not sure if this would convince me to opt for the Galaxy S7 Edge over the Galaxy S7. The possibility of having information available 24 hours from the Always On feature is already available on this model. The thing, however, is that it can be quite invasive when you simply don’t want the display to show you anything. The Galaxy S7 Edge comes with an Exynos 8890 processor. The CPU was developed by Samsung and comes with eight cores, four of them running at a maximum speed of 2.3 GHz and the other four at up to 1.6 GHz. According to Samsung, the CPU and GPU are 30 percent and 64 percent more potent, respectively, than the Galaxy S6. When we look at the results of benchmarking by Metal and Multicore’s Vellamo, we see that the first, which measures the maximum performance in an operation, the CPU frequency is much of the time overclocked or 2.6 GHz. Thus, taking into account that the majority of Android applications use only two processor cores when running, the Galaxy S7 Edge delivers maximum performance the entire time. This is, of course, only on paper. In real life, I had days when the software did not give me a headache or plain ran without crashes or delays. However, one day I downloaded four big games: Need for Speed No Limits, Asphalt 8, the Real Racing 3 and the Gods of Rome. During this time, I started to play one after another and I used almost 4 GB of data. My colleague, Sophia Neun, installed the Need for Speed No Limits and Real Racing 3 on the Galaxy S7 Edge and she did not have the same problems. The problems I had with Need for Speed No Limits could also be related to my internet connection. Moreover, the problem with background applications lock that has become a problem in the Galaxy S6 Edge Plus is not present in the S7 Edge. I had more than 50 applications running in the background with no system delays. The device I’m testing has 32 GB of internal memory and 4 GB of RAM. In it, I’m using a Samsung 120 GB SD card. The fact that the manufacturer offered an expandable memory option is great for storing photos and other media. But don’t get confused, you cannot use the microSD as internal memory. Looking at the examples above and below, you see that even after moving a 1.22 GB game in the device memory to the external memory, the external storage is only occupied by 492 MB. Also, when I search for applications in the device memory, Asphalt 8 is among them, in Settings > Storage > Device Memory > Used space > Applications. Samsung in the United States told Arstechnica in February that it chose against Adoptable Storage, stating that " our users want a microSD card to transfer files between their phone and other devices (laptop, tablet, etc), especially the photos and videos they shoot with the camera." In addition, the manufacturer claimed that misuse of this feature may cause the card to “be erased the first time it is inserted into the device." You have to keep in mind that, though the Galaxy S7 Edge is running Android 6.0.1 Marshmallow, its microSD card functionality is the same as we had in the Galaxy S5: you can’t just add a 32 GB card to the 32 GB S7 Edge to create a 64 GB device. Apparently, Samsung has yet to evolve on the question of speaker quality. The speaker audio is high but that does not mean it’s necessarily good. Playing Spotify albums at home or indoors is not a problem at 75 percent of the volume, but after that, depending on the genre of music, the audio is noisy. The worst thing, is Samsung really invested in this device for consuming media and put a great screen on the device for gaming. However, in most cases, plugging in an external speaker while playing games or watching video is necessary. To get better sound quality, you can use the headphones that provide stereo audio. However, if you are gaming, the timing in gameplay will be distorted. Just as we saw in the Galaxy S6 Edge and Galaxy Note 5 models, among others, Samsung offers an audio equalizer for the Galaxy S7 Edge, which can be used to optimize the sound of videos and songs that do not use players like Spotify. So with the headphones (via cable or Bluetooth) you can see an improvement in the audio effects, but beware, this is not a cure-all. The Galaxy S7 Edge kit includes a headset for two different ear sizes. A radio is not included in the device so you’ll have to use a streaming radio that uses data if you want to use this. The audio quality for calls is good. The speaker is great and the microphone is able to capture voice and filter out background noise. The size of the device does not interfere with audio quality for calls. The camera of the Galaxy S7 Edge is one of the major highlights of the device. The new sensor with an f / 1.7 aperture does an excellent job in poor lighting and the larger pixels assist in the sharpness of images in these conditions. The result is quite impressive, I used the camera to take pictures at night and can easily see what was shot on the screen in vivid detail. The Galaxy S7 Edge camera has a lower resolution than the Galaxy S6 Edge Plus but the sensor uses dual 12 MP technology. This means that all pixels of the image sensor photodiodes have two instead of one. Thus, the sensor is able to focus quickly. When an object in focus rapidly changes position, like a moving car, the camera focuses almost instantly. Samsung claims that the Galaxy S7 Edge takes 95 percent brighter photos, which is 56 percent more light than with previous models. Because the test was not done in a controlled environment, I cannot say definitively whether this figures are completely accurate. However, analyzing the images captured with the camera, they certainly have improved greatly in this regard. The camera controls are very intuitive, just slide your finger across the screen to access the different camera modes and the gallery. To exit the gallery, and go straight to the camera, just swipe your finger from left to right on the screen. Capturing images is also done in various ways, especially when using the front camera. Therefore, you can use the touch screen, the volume buttons, heartbeat sensor and standard camera button. There are some camera modes that are worth mentioning in this review. The gallery mode now offers the moving picture feature, so you can show the images on the display with greater detail. Two other video resources are the ‘interval’ (time-lapse) and slow motion. You can watch a sequence of several pictures showing them as time passed. But the slow movement uses three different speeds, like ½, ¼ and ⅛. You can also choose a specific part of the sequence you want slower. The front camera also offers modes for correction and highlighting certain parts of faces in selfies or group photos. The color representation provides an excellent saturation both in pictures and videos. What draws the most attention for the Galaxy S7 Edge is the maintenance of colors, richness of detail, the speed of focus and the excellent color saturation. The Galaxy S7 Edge comes with a battery capacity of 3600 mAh without using any accessories. If we compare this with the previous model, the Galaxy S6 Edge, we are talking about an increase of 1000 mAh. This is due to a few factors, like the increased size of the screen. But in particular, Samsung has used a new flexible battery technology that is able to take advantage of extra space inside the body. The S7 Edge has wireless charging and fast charging technology. In my tests, I tested only with the adapter and cable, but it was still very quick. When the device was at 5 percent, I only need one hour and 16 minutes to reach 100 percent. So if you are in a hurry, you will have no problem charging the device for just 30 minutes. This was the amount of time it took me to charge to 43 percent from 5 percent. In addition to this, Samsung maintained its well-known power saving modes. Of course, you will be limited on the use of the device in these modes. In fact, the S7 Edge software was optimized to save energy. When I launched the Game Launcher, for example, I got the option of ‘saving energy during games’. I prefer to keep power saving options turned off most of the time because I wanted the pictures at a normal resolution. If you need the ‘save energy’ option though, it does deliver a very good experience and yet consumes less power. Below you have an example of the Galaxy S7 Edge in use for nearly 24 hours. From 9 PM Sunday to 5 PM Monday, the device went from 100 percent to 20 percent battery remaining. The smartphone reached 5 percent at 8:45 PM and this was with three AnTuTu benchmark test run. It consumed 30 percent of the battery during the day, so the battery would have endured a lot more without the benchmark tests. The Galaxy S7 Edge is everything its predecessor was and more. The device design, software and camera have improved as you would expect, only now we also have a stronger battery, more power, a microSD card slot, and water resistance. Samsung has managed to better the design of its predecessor in almost every way. While in the S6 Edge will felt there was something missing, the Galaxy S7 Edge is a complete package, a smartphone with a soul. Because time around, not only does it look beautiful, but it has much to offer on the inside. i just upgrade my note 4 to s7 edge. just 16 days with my new s7 edge and it broke down, like total black out even if i charge it no response. then they give me new one same s7 edge model and after 6 days same thing happen. it was 91% battery when the last time i checked it. i thought it just freeze for some reason in my pocket but any buttons not working. it just displays the time and date plus the battery percentage. thats it the green light blinks meaning its on. power button not working even the home button and volume buttons. i tried to charge it but no response either. its my 2nd s7 edge in a month but seems it has a problem. I like Samsung Galaxy S7 Edge so much. No matter with the specifications and quality, it is very good. But meanwhile, the price is high. For those who want to buy a smartphone but with limited budget, just like me. We want good affordable smartphone. Last week, my friend suggested me to get the new smartphone from Bluboo company, Maya for only $69.99, but with 2GB RAM, 16GB ROM, 3000mAh battery, 8MP front camera, 13MP Sony back camera and Android 6.0 OS, what do you think of this device? after having the S5 switching over to the S6 Edge and realizing that it didn't have the infrared blaster I'm definitely not buying the S7. the S5 had it all waterproof, change battery, add memory and infrared blaster. I bought S 7 edges 9 days ago , it fell down on floor from my pocket while sitting the whole distance less than 40 cm and fell on carpet , it got cracked every where . it is the weakest phone had ever seen in my life . i used to I Phone for last 7 years and it never broke when it fell down to similar distance or may be higher distance . this galaxy S 7 is piece of junk . it get very hot when it charge or when installing update . when it broke i called both verizon and samsung and they did not do anything i fell sad to replace with same phone because the new one will broke too . please think before buying this phone . lol Doc Doc... You can barely speak English and you expect me to believe this story of yours? - Sounds to me like a paid troll from a Samsung competitor. I signed up just to say that the explanation of the USB micro port was needlessly obtuse. I read it through like 4 times and couldn't say for sure whether it was micro or type C. Just say those words at some point instead of going on about the adapters and a totally different phone and an unrelated accessory. Otherwise pretty good review! Obviously that. Why on earth is that an unworthy use of an Ir blaster? I have half a dozen profiles set up on my V10 and would consider the lack of ability to control my TV, floor fan, vaporizer, sound bar, etc. to be a serious feature omission. Maybe you should *stop* banging your face into walls; it seems to be causing brain damage. I Agree! I use the IR every day and at this point will not purchase a phone that does not have it! A smartphone with only 32GB of internal storage is a joke. I will stick with my S6 128GB for now. 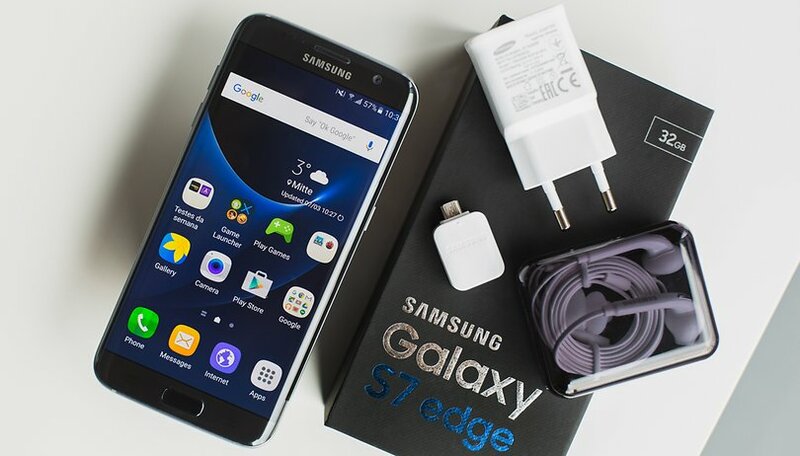 technogala.com/samsung-galaxy-s7-edge-review/ check this link and you will know why it is still a good bet.